I made a healthy little switch to Musselman’s Applesauce. Small diet changes can make a big difference. How lucky is this? In the mail today, I received a free sample of Musselman’s Apple Sauce, just when I made a commitment to lose weight last week. The great god of internet says I can snack on ½ cup of unsweetened apple sauce for 2 points but with a little judgment I can even account for the Musselman’s Apple Cider that I bought and have a drink. The apple sauce Big Cup they sent me is convenient to take along for trips and, even though my granddaughter wants them for school, I got them first for my road trips. I found a new trick of freezing the applesauce the night before wanting to use it and then it not only keeps it cold but it acts as a icepack to keep everything else cold too! My new dieting effort looks promising and now tastes better. Musselman’s also sent me recipes I can use in cooking so I think I’ll use them tonight with a reasonable portion of chicken. Thanks Musselman, but please don’t ask me to start jogging. Making small changes in my diet can add up and make a big healthy difference for everyone who I cook for, including myself. I know everyone else talks about pumpkin spice as their fall flavor, but maybe I am old fashioned and think of apples when I think of fall. #AppleSauceSwap. * Disclosure: I was given applesauce for free to try out. It was totally my choice to write an honest, unbiased review. If you know me at all I talk too much and I never hold back my opinion! Being a blogger, I am often invited to review products, services, exhibits, etc. in exchange for an honest review; But this time I was just given something for free to try out and I thought the product really was so good I wanted to pass it on! Good thing for them I didn’t hate it. I like applesauce with a lot of cinnamon as dessert or a bedtime snack. It’s also good as part of breakfast and lunch. Homemade applesauce is delicious! The nurses made me eat this junk when i was in the hospital. It’s slimy, disgusting and entirely repulsive. Ugh! I’d rather eat rocks. When life turns my stomach (and my stomach turns my life), I find a small cup of applesauce to be just right. Easy on the system, a bit sweet, but not too sweet. And in the individual cups I don’t have to feel like I have to eat a bunch at a time. All that to say, yay for applesauce! Oh, and I had no idea I could freeze it! I have enjoyed that applesauce before also. We try to make our own when we can. The spices used for pumpkin pie are pretty much the same spices used for mulled cider and apple pie, just variations in proportions. Cinnamon, cloves, allspice, ginger, nutmeg. You can have the best of both worlds of pumpkin spice and apple spice. Just add whatever spices you want to your applesauce and apple cider, in whatever proportions and amounts you like. A simple recipe for mulled cider-Pour a gallon of cider into a pot or slow cooker, add 2-3 bags of Good Earth Original Sweet and Spicy herbal Teabags, simmer for 15 minutes before serving. Can keep it on low heat for a few hours to serve as needed. My favorite mulled cider. Thanks for the great reminder about using applesauce to make small and healthier changes in our diet! We always liked Musselman’s since my husband’s grandmother (who lived to be 100!) 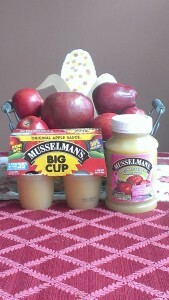 only ate Musselman’s, no other applesauce.